The shade house filled with orchids (L) and the group in the orchid display area (R). Arpophyllum spicatum (L), colorful Cattleya hybrid (LC), Brassia hybrid (RC), and the national flower of Costa Rica, the guaria morada, Guariantha skinnerii. The collection of miniature orchids is one of the largest and most renowned in the world. We got to view hundreds of these miniatures in the shade house arrayed in containers on benches or mounted on small slabs of wood or bark hung on wire mesh walls. Everyone was fascinated by these tiny gems, with small flowers that were easily overlooked because of their small size. Unfortunately not all had name tags, and even some that did were illegible from the moss growing on the tags. David photographs one of the miniature orchids mounted on wood squares (L) and two unidentified small orchids (C and R). Unidentified orchid about 1 inch across (L), an unidentified miniature orchid with dozens of 1/8 inch wide flowers on a long spray (C), and Restrepia guttulata (R). Pleurothalis spp. showing whole leaf (about 1.5 inches long) with flower in center (L), closeup of flower (C), and red variety (R). We also wandered the trails through the secondary forest to see many native plants, a cactus and succulent garden in a cleared area, collections of heliconias, bromeliads and ferns. The huge Anthurium salvinii (L), shampoo ginger, Zingiber zerumbet, native to India (C), and under a tree fern (R). The cactus and succulent garden (L), a prickly Pereskia cactus with bromeliads on the trunk (C), a spiny lizard (Sceloporus sp.) (R). Colorful Heliconias (L and C) and closeup of flower of middle inflorescence (R). But after this we had a change of plans. A mudslide on the Pan American Highway prevented us from taking the planned route to our accommodations high in the mountains. With a long detour on an alternate route, we couldn’t do the coffee plantation tour that was planned in the San Gerardo de Dota region along the way, but we did see lots of coffee plantations and trucks taking picked coffee berries to the small, local receiving stations. Truck carrying coffee berries (L) to local receiving station (R). 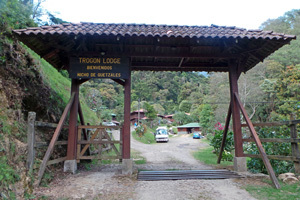 Entrance to Trogon Lodge in the Talamanca Mountains. The sun was just starting to dip behind the mountains by the time we arrived at our mountaintop accommodations in small cabins scattered across the steep slope of the property at Trogon Lodge, but we had over an hour of light to watch hummingbirds and wander around the lodge. 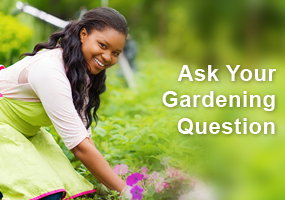 Both exotic ornamentals and pretty local plants are incorporated in the neatly manicured grounds, including several types of fuchsias. Most of us think of fuchsias as pretty annuals for shaded hanging baskets, with attractive pendulous flowers reminiscent of ballerina’s skirts. But the genus Fuchsia is a huge and variable group of primarily tropical or subtropical shrubby plants in the evening primrose family (Onagraceae), with about 110 species ranging from trees to low ground covers (although most are shrubs), and most are perennials, not true annuals. The flowers are all tubular with four long, slender sepals and four shorter, broader petals, but they may be pendulous or held upright, be borne singly or in large clusters, and range in size from ¼ inch to several inches long. A traditional garden fuchsia flower is formed of united sepals, which separate into four lobes that often flare outward, but that is not always the case with the species. The diversity of Fuchsia species is highest in South America, but some occur in Central America and as far afield as New Zealand and Tahiti. 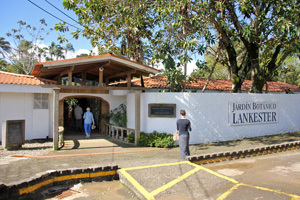 There are seven species native to Costa Rica and several of them can be seen in this area. Most people don’t recognize Fuchsia paniculata as a fuchsia, because it looks more like a lilac with terminal panicles of numerous tiny erect flowers with reflexed reddish purple sepals and lavender petals on a small tree. It is native from the pine-oak forests of Oaxaca, Mexico to the evergreen cloud forests of Central America, found in open sites and along roadsides where its showy clusters of flowers are easily seen. You have to look closely to see the tiny flowers of F. microphylla, which as its name suggests also has small leaves, on a low to medium, vine-like shrub that occasionally is epiphytic. The tiny red flowers are borne singly in the leaf axils. F. microphylla in Costa Rica is the subspecies hemsleyana, with the other 5 subspecies occurring primarily in Mexico. 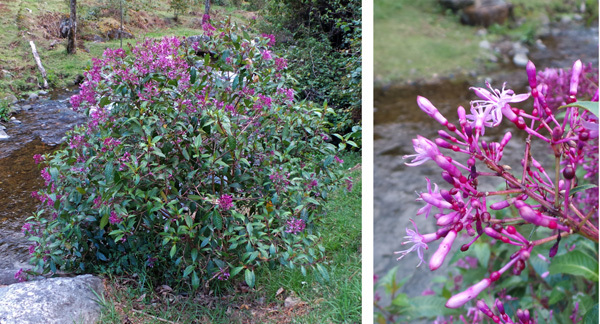 The other high elevation species is F. splendens, with small clusters of pendant pink-red and green flowers in the upper leaf axils of the tall shrub. Then there are the locally-created hybrids with pendulous red flowers that attract a bevy of hummingbirds in the garden. In addition to the native species found in this area, F. jimenezii is another species we might see later in the trip that looks very similar to F. paniculata, but it occurs at lower elevations in southwestern Costa Rica. We’ll be setting off early the next day for a long drive to the south in order to be on a boat to the Osa Peninsula in early afternoon. We’ll be staying at a lodge deep in the rainforest, without internet access. So I’ll have to take the weekend off from blogging – look for the next post Monday evening (barring any technological glitches). 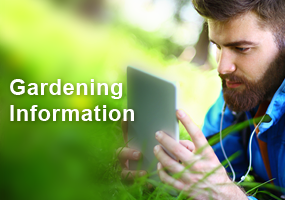 Excerpt from the 2014 Annual Report featuring the Bluff Country Master Gardeners. 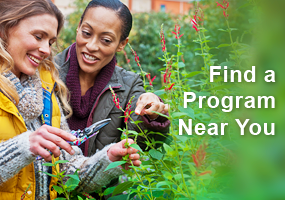 Excerpt of the 2014 Annual Report featuring Racine and Kenosha Counties.